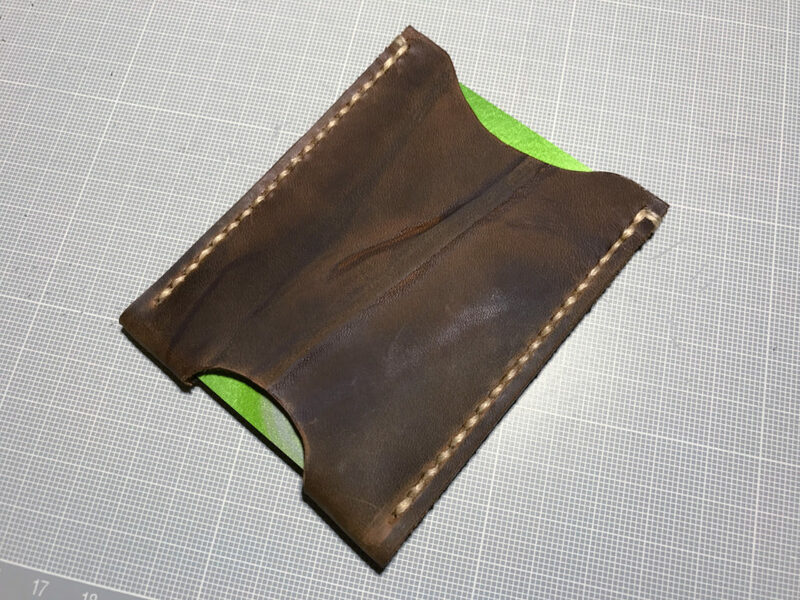 Continuing with leather project two, this is a card sleeve, or card holder in pull-up leather. Apparently only vegetable tanned leather can be successfully burnished so I added some beeswax to the edges to keep the fuzzy flesh fibers together. Don’t know if that’s something “you do” though. I’ve probably broken some rule. I’m struggling with getting my head around stitching backwards though. The first stitch I did, the right one in the photo was easy enough, but then when I did the other one I had do it backwards, because I wanted to start in the same end as the other side. And that meant going from having the front of the item to the right when stitching to having it on the left. And that meant… what? Starting from the front? and putting which needle on top? Etc. etc. I need to look into that. The blemishes going across the card sleeve is because this piece of leather is taken from the edge of the scrap leather I had. It’s some kind of creases from the tanning process. But I actually thought they were nice and gave some character.